Kirsten Gillibrand: What Better Way to Celebrate Mother’s Day Than to Help Make Sure Others Don’t Become One? 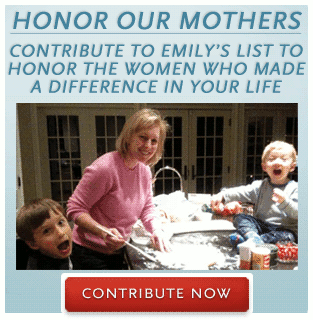 Senator Kirsten Gillibrand (D-NY) has been featured on a Mother’s Day-themed fundraising e-mail for EMILY’s list, a political action group that supports abortion. This Mother’s Day, I can’t think of a better way to honor all the mothers in the country — past and present — than with a contribution to EMILY’s List. They’re the ones working tirelessly to elect the pro-choice Democratic women who are making sure that our freedoms are protected for generations to come. So, this year, join me in commemorating Mother’s Day with a contribution to EMILY’s List to help elect the Democratic women who will continue to secure our rights. On Mother’s Day, let’s get women involved and make sure they know who is truly fighting for them – the pro-choice Democratic women EMILY’s List is working each day to elect to office. I’ve said it before: as the mother of two young boys, finding the right balance between work and family isn’t easy. But we do it, we figure it out, because it’s our children — our nation’s future — that we’re all fighting for every single day. Except apparently for our unborn children. On a side note, here’s an interesting reminder about EMILY’s list, especially with the President’s recent gay marriage remarks. In 2008, the group funded a congressional campaign in Tennessee for Nikki Tinker. The Tinker camp refused to condemn or repudiate fliers that circulated about her opponent – a promoter of gay rights. The fliers were distributed by a group that “detest(s) the alignment of African-Americans with homosexuals and lesbians as being equal.” The fliers themselves were laced with anti-Semitic and racist statements. What does Nikki Tinker think about anti-Semitic literature being circulated that might help her unseat 9th District Congressman Steve Cohen in the Democratic primary next August? A fair question, which Tinker declined to answer this week after a flier stating that “Steve Cohen and the Jews Hate Jesus” began circulating in Memphis. The question goes to the character of the woman who wants to represent the 9th District, and 9th District voters deserve an answer. But Tinker declined to return a phone call about the flier. So EMILY’s List had no problem funding a smear campaign that featured anti-Semitic, racist, and homophobic literature – as long as the candidate they backed supported the right to terminate the life of a child. And now they’re using Mother’s Day to support that same right. Of course, this isn’t the first time that pro-abortion groups have used Mother’s Day as a fundraising tool. The Planned Parenthood abortion business is already jumping on the Mother’s Day bandwagon — days before families celebrate their mothers this weekend — with fundraising appeals seeking donations to further its pro-abortion agenda. Planned Parenthood has exploited Mother’s Day in the past for donation appeals and, this year, the donation requests are centered on furthering Planned Parenthood’s abortion agenda globally. Planned Parenthood, of course, ignores the violence abortion causes women and children. What is with the far-left and their War on Children? Does Gillibrand recognize the fact that one cannot celebrate Mother’s Day – if that woman did not choose life?